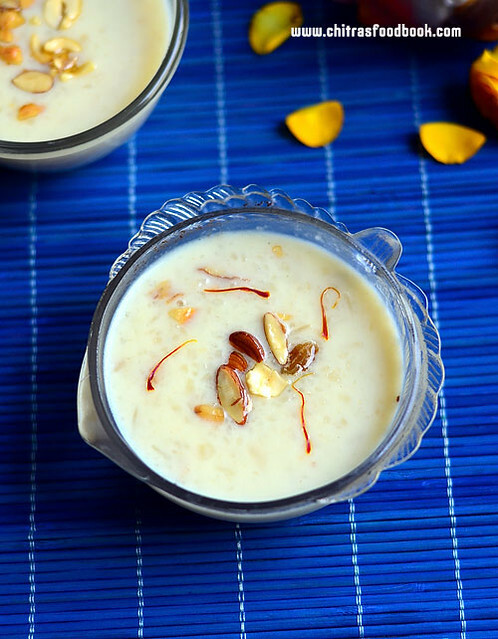 Poha kheer also known as Choora Kheer ( Aval Payasam in Tamil, Pressed rice/Rice flakes pudding in English, Atukula payasam in Telugu, Avalakki payasa in Kannada) is a creamy, rich North Indian dessert recipe made using Milk, pressed rice, sugar, nuts and cardamom powder. Krishna Janmashtami/Gokulashtami festival is around the corner. We South Indians i.e Tamil people make sweet seedai, Salt seedai, Kai murukku, Paal payasam and appam for the festival whereas North Indians make their specialty recipes like Rice Kheer/ Poha kheer, Kalakand, Shrikand, Gopalkala, Mathura Ke peda and many more. Actually I bookmarked these recipes long back but I couldn’t try them.So this year I started with a North Indian recipe for Krishna Jayanthi festival.. I followed Sanjeev Kapoor’s recipe but used more milk than the mentioned quantity. Its so easy to make and it came out creamy and delicious.This kheer can be given for babies too. Actually Sendhil & Raksha is not a big fan of Poha kheer with sugar. But they liked this a lot. 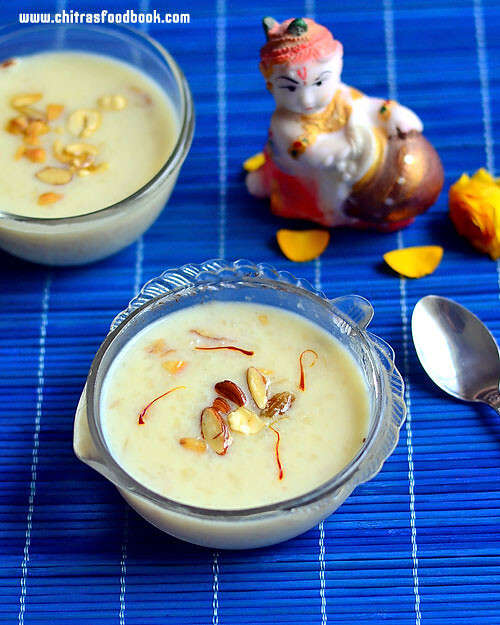 Try this easy kheer recipe for this Janmashtami festival and offer to God. Lets see how to make poha kheer with step by step photos and a video ( Will update soon) ! Add the roasted rice flakes to the boiling milk. Cover and cook the poha in very low flame. It takes nearly 10 minutes to cook. Mix it well once or twice in between. Make sure the bottom is not burnt. If needed, add 1/4 cup more milk in the middle. After the poha is cooked well, add sugar and mix well. Add cardamom powder and roasted nuts. Add saffron threads if you wish. Mix well and give a boil. Switch off the flame and serve warm. Note : This kheer thickens over time. So add more milk and sugar while serving to adjust its consistency and sweetness. Boil for a minute and serve warm. Enjoy ! 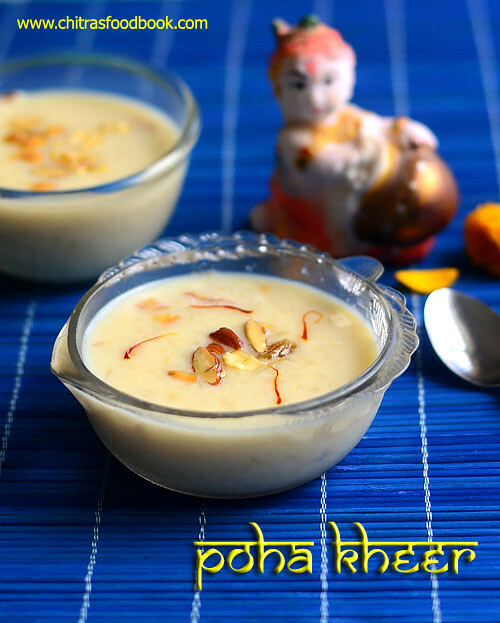 Easy, yummy Poha kheer is ready to enjoy !